There are billboards for the next big thing. There are the quarterly showcases of the latest newest. The world is enraptured with new and better. In his book Ordinary, author Michael Horton argues that this same restless and revolution-seeking attitude is prevalent not only in the world (e.g. business, marketing, etc.) but also within the church. The next big pastor will be at the next big conference. The next big teacher will publish the next big program with that publishing company known for innovation. “Rinse, wash, and repeat” the shampoo bottle says. This psychological and sociological bent for more, better, and now creates an endless spiral where the latest must always be an improvement on the last or suffer ridicule. In the church this has translated to: stay with the times or be left behind. “How to keep millennials in church” being the recent favorite get-with-the-times fad. More authentic. More results. More cowbell. 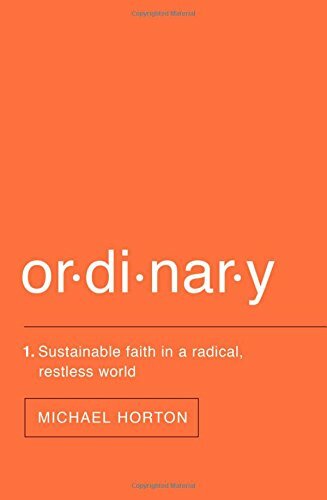 In Ordinary, Horton presents a stunning counter-cultural strategy to negate religious restlessness: be ordinary. Stop seeking that next big thing and settle into sustainable Christian living. In “Part 1: radical and restless” (chapters 1-6), Horton addresses this epidemic of socially accepted ambition (chapter 5) and what impact it has had on the church (chapters 4 and 6). The problem is both personal and pastoral. It exists in houses and congregations. After some Godly criticism (chapter 1), Horton defends ordinary living as “not mediocrity” (chapter 2) and “not passive” (39). Ordinary is not settling for less than what God has commanded. Being content is not resorting to half a Christian life. Instead, these are indications that Christ and God’s ordinary means are being manifest in Christian life. Horton speaks about how community and technology battle against each other in an unprecedented way (58-65). “The next big thing” has become “a tradition unto itself” (70-74) as it continues to seek bucking tradition. This restless desire for something better has brought the church into a perpetual search for spiritual revival (74-80). For Horton, obsession over revival, a concept unfound in the Scripture, occurs when the church diminishes God’s ordinary means and begins to seek something miraculous. It permits the church to put off today the tedious task of living faithfully in God’s gift as it waits for God’s special gifts tomorrow. In “Part 2: ordinary and content” (chapters 7-11), Horton begins to expand on what ordinary, vocational Christianity looks like. Fundamentally, ordinary Christian living is less contractual and more covenantal (129-135). This affects homes, congregations, work places, and relationships. This also reveals Horton’s real solution to restless Christianity: historical, confessional Presbyterianism (117-119, 139-144, 146-149, 182-189). Horton’s solutions are Presbyterian solutions and many evangelicals as well as Reformed Baptists will be unable to get behind every one of these solutions. In conclusion, Ordinary is an outstanding little book. For individuals who are already in confessional Presbyterian churches, Horton’s words will be preaching to the choir. Worship centered around the means of grace, catechismal instruction, and family worship have long been staples of the Reformed faith. For those outside this tradition who are searching out a normal and vocationally focused Christianity, Ordinary will promote great thought and discussion.